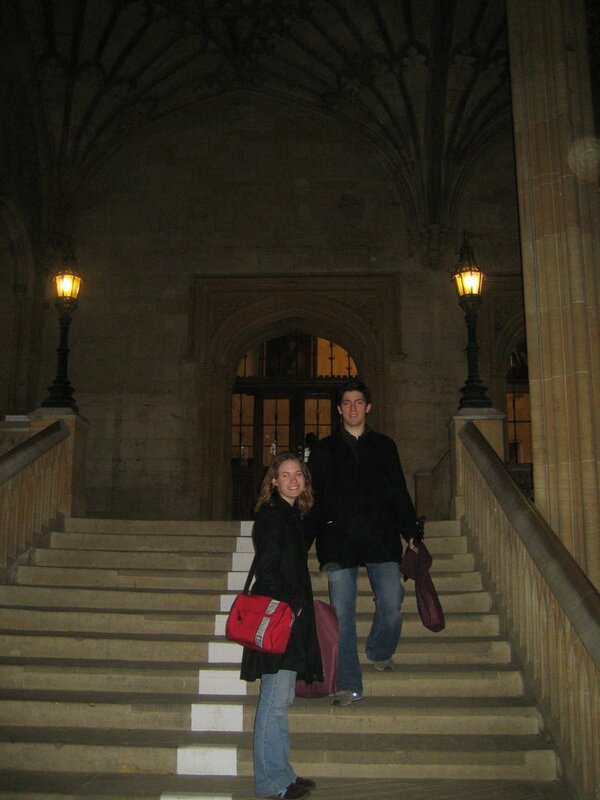 Megann and I stopped on the way to the train station to talk to the bullring's bull (note I have one barefoot)!, Oxford University's Hertford Bridge, overlooking one of the school's quad, and Andrew and I on the staircase that Harry Potter was filmed on! Well, on Saturday Andrew and I are sitting on the computers in library when his friend Will called. So, Will is studying in Rome and he was visitng Barcelona when his plane got changed, so he had to take a detour to London for a night. Since Will and Andrew know a girl living in London that is their old boss we thought why not take advantage of the situation? Friday night we all went to a Yellowcard concert in Brum. It was really fun but during one point of the concert (I know I don't tie my shoes tight enough) I lost my shoe! It was no where to be found! Aftwerwards we tried to locate it but it was just not going to happen. So.....since we were planning on leaving that night Andrew hopped in a taxi and went to get a new pair for me while Megan and I walked over to New Street train station to get our tickets. 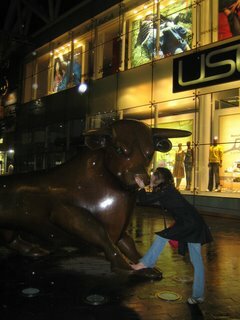 Yes, I didnt have a shoe on, and since the ground was wet from earlier rain, no sock either. It was really fun though! Anyways we made it to the station, met back up with my new pair, and got on the last train to London. Once we arrived at Euston we made our way to Paddington where we met up with two of Andrew's friends from school back home! We all hung out and then stayed in Katie's flat. It was one of the most random experiences ever. Sadly, Andrew's friends had to leave wicked early in the morning to catch their plane back to Italy. So, we all got up really early to and caught a train to Oxford! 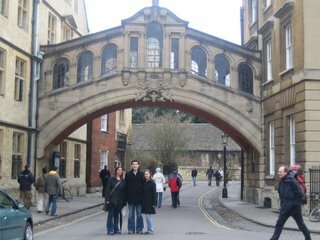 Oxford was amazing looking. 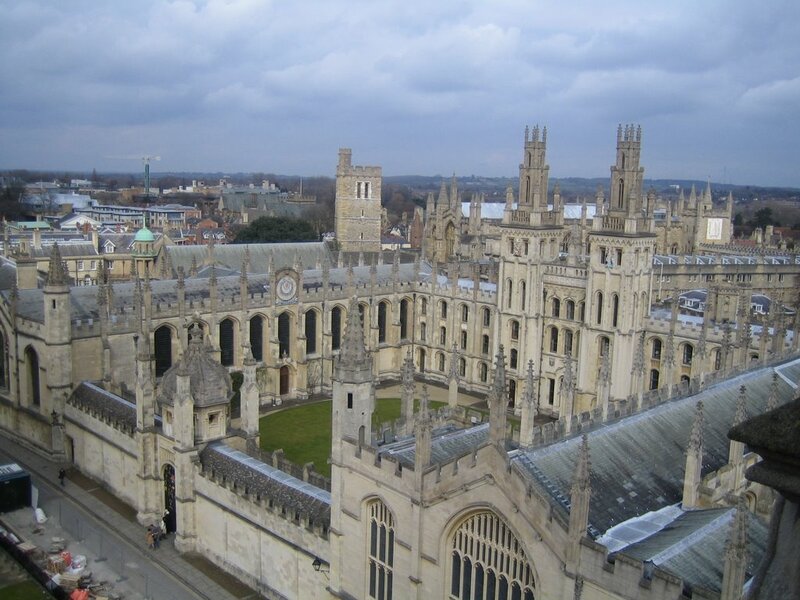 The town is completely dominated by Oxford University, it would be an incredibly different experience to go to school there I am sure, interesting looking uni life and all. Anyways, we paid to get into one of the schools to tour around (the college is separated into a lot of different schools, each with their own residences and quads that are all blocked off to the public and you have to pay admission in order to enter them) and we wanted to see one more at the end of the day but we just missed the time that they closed...we kind of did the whole please let us in bit lead by Andrew and they finally let us go in, for free (cause they didnt want to bother)! In one of the colleges there was acutally a deer park and a giant field that you were allowed to walk around. Also, a small creek that was ideal for a game of winne-the-pooh-sticks! I taught Andrew and Megann how to play, it was good times. The dinning commons in Chirst college was what they re-created for the Great Hall used in Harry Potter! It was actually smaller than one would think but very beautiful. 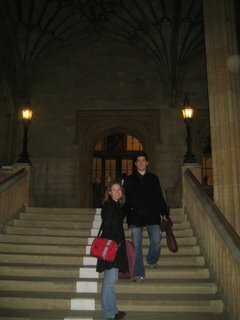 Also, we got to walk up the staircase where they filmed part for the movie (the first one where McGonagall greets all the first years)! That was really cool! I guess a number of scenes have been shot at that college. Also, Lewis Carroll wrote the Adventures of Alice and Wonderland there. Also, we saw where Edmund Halley lived and had his observatory (like the comet), where Robert Hook and Boyle lived! We also went shopping in the Oxford school stores and looked around the Scientific History Museum, they had just tons on Astrolabes. We also looked at Blackwell's bookstore (the largest in Britian) and went up the Cathedral tower. At the end of that night we ate and caught the trains back to Birmingham. It was a very eventful 24 hours for sure.